Another little recipe, based on some leftover cooking. It was a beautiful day on Wednesday. After work, I strolled over to Fin and Flounder where I bought some mackerel. I pottered on to The Old George to scope out the new beer garden (wonderful! ), and I picked up some veggies on the way to make a salsa to go with the grilled mackerel. But last night the weather turned. It was grey and drizzly and overcast. I didn’t feel like using the leftovers to make another salad. Not a cold, crisp one anyway – something warmer and more comforting. 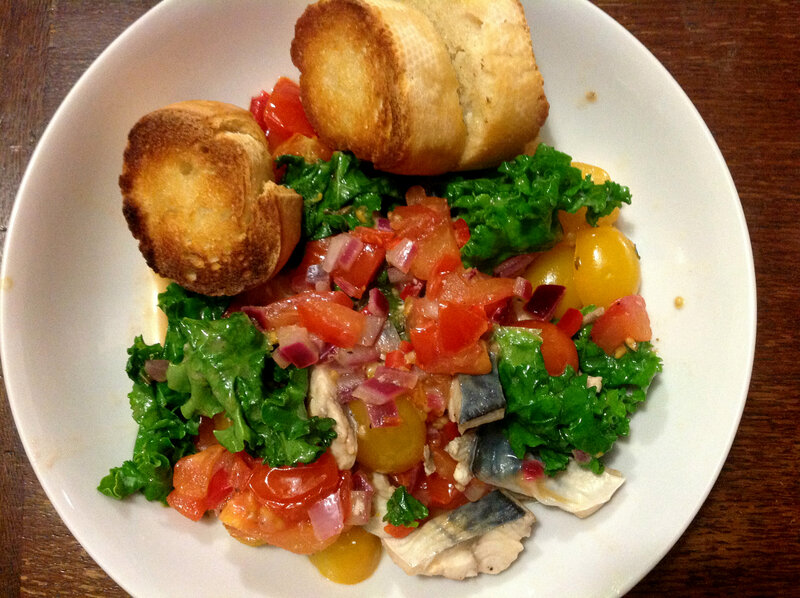 So I turned the two left over mackerel fillets and leftover tomato salsa into a warm salad. Tom and I both decided that it was even better that way, so I thought I’d share the recipe here. Mackerel is a lovely cheap and healthy fish. There’s good availability all year round, but they seem to be particularly thriving at the moment. When I visited Billingsgate Market yesterday morning, the mackerel were still in rigor mortis. Firm-fleshed, bright-eyed and practically jumping out of the boxes. Even more incentive to give this recipe a go. 1. Start by making the ‘salsa’. Put the vine tomato, baby tomatoes, pepper and red onion in a bowl. Add a generous pinch of lemon zest. 2. Squeeze the lemon juice in a jug. Mix with oil, to taste – roughly a 1:3 ratio of lemon juice : olive oil. Heavily season with oregano, salt and pepper. Pour over all the above vegetables, and leave to marinade. You can, of course just leave this for just five minutes. The ‘salsa’ I used last night had steeped in the dressing for 24 hours though, and really benefitted from it. The vegetables were softer, and the dressing was richly-flavoured from their juices. 3. Pour the vegetable salsa and all the juices into a frying pan, and heat. Add the kale, and then the mackerel pieces, so they’re almost poaching in the juices and steam. 4. Meanwhile, rub a garlic clove over some slices of baguette, and grill. Serve alongside this warm salad.